If you’ve struggled with removing windshields and other auto glass in the past with traditional tools such as a glass knife, the job has become a lot easier thanks to induction heating technology. Our Pro-Max is a powerful 2-kilowatt induction heater, which uses Invisible Heat® to easily remove a variety of hardware and components. The Pro-Max comes with a range of accessories, including the U-311 Glass Blaster® attachment, which is ideal for quickly and cleanly removing bonded windshield glass from the outside of a vehicle without touching interior trim. There’s no need for wires, knives or consumables with the Glass Blaster. 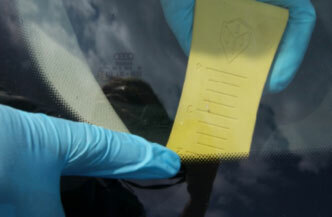 Invisible Heat releases the urethane in hard to reach areas (curves and deep pockets) of windshields were other glass tools can’t go. 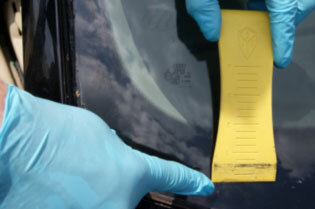 And it will not damage the encapsulant (blackout masking) and its non-metallic tape protects the glass from scratches. With the Pro-Max, you will be able to move windshields in less than 12 minutes and other auto glass in 3 minutes or less. 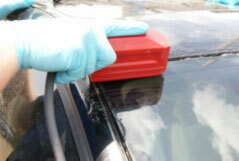 Because the Glass Blaster leaves window structures intact, the windshield can also be re-used instead of disposed of. Equipment Needed: heat resistant gloves, overalls, goggles. Top Tips: Fully read the manual before use. Windshield removal success requires a little patience. Let the Glass Blaster do the work. Don’t muscle it out. Wiring should be pulled back from the area being heated as a current could be induced into the wiring causing damage. Also, dragging the insulated cord across a hot metal surface could melt the cord. Step 1: Locate the urethane bead by using an L-wedge. From inside the car, push the long portion of the L-wedge between the glass and pinch weld until it hits the urethane bead. Step 2: Bring the L wedge to the outside and make a marking on the glass where the urethane bead is located. Do this to all four sides. 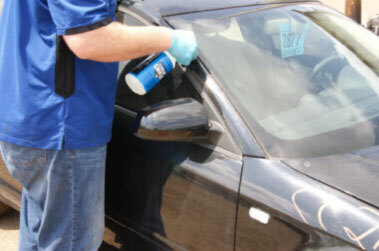 Step 3: Spray water or thermal spray gel (which provides more protection for painted surfaces) around the windshield to protect the vehicle’s paint from possibly overheating. Be careful to spray the frame only and remove excess water off the glass. Step 4: Start in a corner and work the Glass Blaster attachment smoothly and slowly both ways, approximately 6-8 inches, until a corner pops loose. 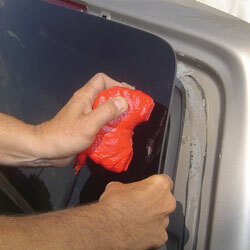 Tip: There’s less risk of overheating the paint work by using the thermal spray gel. 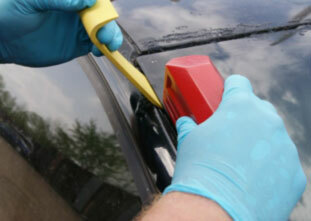 As long as you can see wet gel on the paint work, and it’s not bubbling or dried out, the paint is protected. If you see the gel bubbling, you need to move the Pro-Max away from that area to where it’s not bubbling. The initial point of release can be touchy, so as to not overheat the painted surface it’s best to start at a point that isn’t seen, like the cowl. Step 5: Using an L wedge for leverage, work the Glass Blaster across the top and around the entire window, while keeping outward pressure on the glass. You can tell if you have enough heat by the bend in the glass – but be careful not to bend it too much. The Glass Blaster attachment is a powerful tool that works quickly – be careful not to overheat any areas. Step 6: As the urethane releases and slight outward pressure is applied, you will see the glass move or vibrate where the glass has been released. The point where the glass quits moving is the point still attached to the pinch weld. 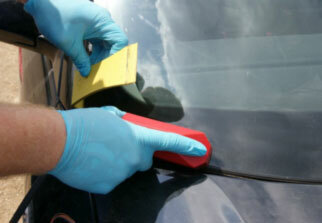 When you feel the windshield has been totally released, place the palm of your hand behind the windshield and using slight outward pressure, check and see if the bond has been released from the entire perimeter of the windshield. 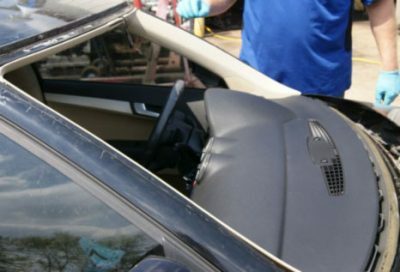 If the windshield is released, it would help to have a colleague to help you hold the glass to prevent it from falling.